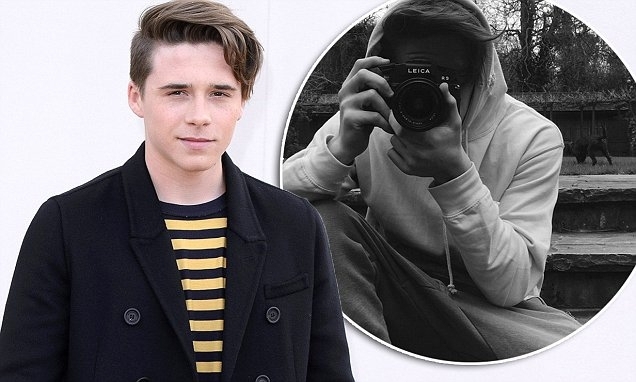 [29 January 2016]- British fashion house Burberry is putting model Brooklyn Beckham at the helm of its Snapchat account to promote the Burberry Brit fragrance. Burberry reposted an Instagram image of Mr. Beckham, the son of David and Victoria Beckham, obscured by the lense of a Leica camera as his photo was taken. In the original posting, Mr. Beckham expressed his excitement to photograph the Burberry campaign on Saturday, Jan. 30, being shared via Snapchat. While Mr. Beckham did not share the details of the campaign or what he would be photographing for Snapchat, he did use the hashtag #ThisIsBrit, used for Burberry’s Brit fragrance. Likewise, Burberry did not share any details regarding the campaign opting to repost Mr. Beckham’s image. The brand also followed up with a teaser video posted to its account featuring the Snapchat ghost and gritty images of a city, a skatepark and references to the Brit fragrance. What has been previewed in the Snapchat teaser and the brand’s selection of Mr. Beckham, who turns 17 in March, offers consumers a much younger aesthetic than Burberry traditionally expresses. By hosting the campaign on Snapchat, and likely Instagram afterwards, it is clear that Burberry is working toward establishing a connection with a young demographic of consumers.